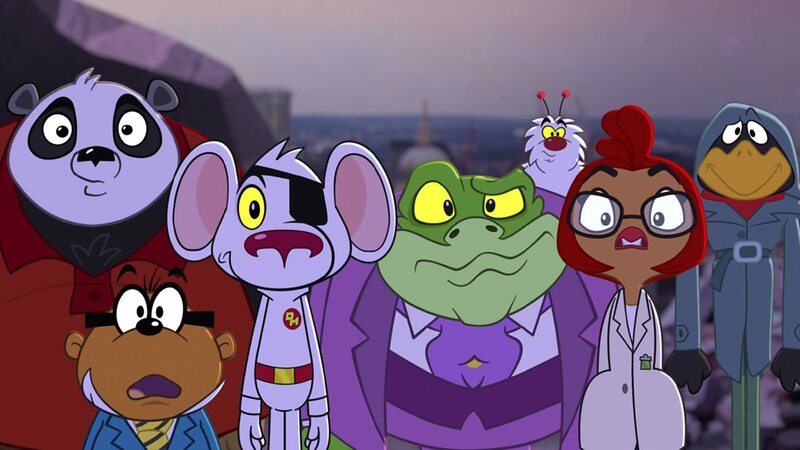 Netflix recently dropped a new version of the old Danger Mouse cartoon. I am a fan of the old series. How did the new one stack up? Not bad, actually. It’s not the same by a long shot, but in certain ways it both honors the original incarnation and finds a way to make a new version distinctive. After all, what was the appeal of the old show? By and large it was absurdest humor combined with clever word play. It certainly wasn’t the animation. The old series’ animation frequently reused shots as often as possible. And while I endorsed the old show when Netflix picked it up, something happened as I worked my way through it. Towards the end of the original series’ run, I realized I was watching episodes that hadn’t aired on Nickelodeon when I was a kid. And those episodes I was seeing for the first time weren’t very good. The first few seasons of the show were still fun and delightful, moreso than the DVD versions which included the narrator recapping the plot every few minutes. That works fine with a commercial break, but can be rather annoying when there aren’t any commercials to interrupt the show. But what about the new version? For the most part, the new series is rather faithful to the original over a series of mostly 12 minute long episodes, making some changes but sticking to the basic concept of Danger Mouse being the world’s greatest secret agent, bringing along cowardly hamster sidekick Penfold, taking orders from addled-brained Colonel K, and often matching wits with the evil Baron Greenback. That stuff all stayed more or less true. And even with a new voice cast, the actors playing Danger Mouse and Penfold actually sound a lot like the original characters. What changed most was the energy of the show. Everything zips along. Part of that is just an obvious improvement in the show’s animation. These characters can move, so they should. That helps on a narrative level as well. Besides showing more agents in Danger Mouse’s agency, all with the title “Danger” in their names, it also allows the series to play a bit with Danger Mouse’s personality in an interesting way. While the old Danger Mouse was mostly just a straight good guy, often playing off Penfold’s cowardice and bad puns, the new Danger Mouse does this as well with the added plus of being something of an adrenaline junkie. He’s Danger Mouse, so he seems to feel he must always be doing things to save the day in the most dangerous way possible. The new twist also makes him a little dumber than he used to be, which can also allow Penfold to occasionally save the day. Other small changes include giving Baron Greenback some kind of German accent, and a running gag where Colonel K apparently never remembers who Penfold is or why he’s hanging around. And while the old series seemed to be set in a human world where small animals were off doing things that would conquer or save the world, there are no humans to be seen anywhere in the new show. If anything, there’s a bit more potty humor this time around, fitting that one of the reoccurring villains is the computerized toilet Dr. Loocifer. One addition to the show is something of a changeover. The original series had occasional guest appearances by a small mole scientist with a German accent named Professor Squakencluck. Yes, despite a name like that, he was a mole. The new show not only made Squakencluck a regular character, but also a chicken with what sounds like a Scottish accent, and changed the character’s gender, seeing as how female characters were few and far between in the original version of things. Cast as something of the straight character who finds Danger Mouse’s actions and intelligence nothing but frustrating, Squakencluck provides something of a counterpoint to the action at all times. American agent Jeopardy Mouse (another female character) seems to play a similar role wondering why Danger Mouse must do things dangerously when time is always of the essence. The meta humor didn’t go away either. In the Count Duckula episode, after defeating the Count, Duckula flies off while remarking he learned from Danger Mouse that reboots are always possible on television. The show isn’t perfect, but it’s fun. And it cast Brian Blessed as Santa Claus for the extra long Christmas episode. That’s enough to get the show a good eight out of ten broken Squakencluck gadgets. And John Oliver’s promised bad guy isn’t in the current batch of episodes, so there’s more on the way from the looks of things.